Smart watches from the likes of Sony and Samsung, and Google Glass and fitness devices such as the Nike+ product family, are set to revolutionise the relationship people have with internet-connected devices. For analyst Gartner, the strongest consumer base for wearable electronics is fitness enthusiasts, but wider interest in these devices is leading to broader adoption. The worldwide revenue from wearable electronic devices, apps and services for fitness and personal health is anticipated to be $1.6 billion this year, increasing to $5 billion by 2016. Gartner predicted companies would be most interested in wearable electronics to extend their product lines in innovative ways that enhance their brand. The analyst said such companies would focus on products that have capabilities beyond fitness and position the wearables as accessories to their customers’ smartphones, tablets and other devices. The availability of wearable technology is set to grow significantly as the cost of computing falls. According to David Sovie, managing director with Accenture’s communications, media and technology group, the wide availability of sensor technology and wireless communications will act as a catalyst for wearable technology innovation. "Affordable sensor technology that measures temperature, pressure, orientation, heart rate, wind pressure and the availability of open standards such as next-generation Bluetooth or Wi-Fi creates a level playing field for new companies." For instance, fashion designers can take off the shelf parts like the new Intel Edison computer (pictured), which is the size of an SD memory card. The Racing toward a complete digital lifestyle study from Accenture found almost half of the 6021 consumers who were asked, said they were interested in buying smartwatch functionality. More than 40% are interested in wearable eyeglasses. More than half (54%) are interested in buying a health monitor as either an application on the phone, laptop or desktop or as a dedicated device. Fifty-two percent are interested in buying a fitness monitor device or application. 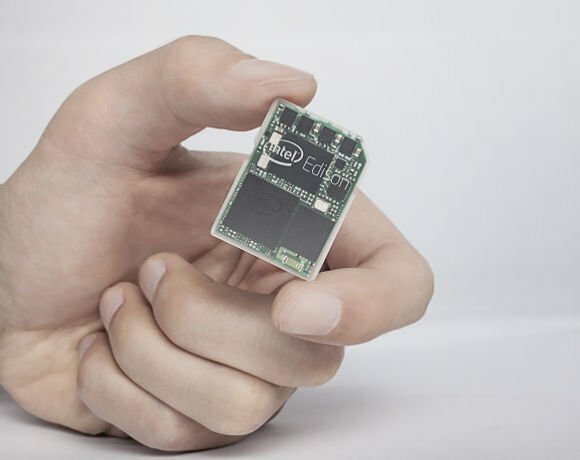 Affordable sensor technology creates a level playing field for new companies. Accenture believes interest in wearable technology underscores the growing consumer desire to be more digitally connected at all times using a "constellation" of multiple devices. Leading providers will understand how consumers are using each device in the context of others, how to build engaging relationships with customers and how new products can be introduced to fulfill their unmet needs, the Accenture report said. Sovie said customer data could potentially live in silos, such as on the Nike+ community site for the company’s fitness devices. But he said: "A lot of devices will be tethered to smartphones so a consumers will be able to create their own experiences [with their data]." This will become an important factor when consumers begin using two or more wearable devices. Information collected from these wearable devices will translate into vast amounts of data, which Sovie believes could be used by the individual and in application areas such as healthcare and medical research. A device such as Google Glass could augment reality in the workplace. Last year in an interview with Computer Weekly, GE’s head of software, Bill Ruh, spoke about how a camera built into an operator’s headset could help onsite technicians fix complex parts, or enable a product engineer to see a recording of the repair if something was fixed incorrectly. Looxcie is a company that has developed such a head-mounted video camera, called Vidcie for real-time video-based collaboration in the field. Beyond healthcare and high-end engineering services, enterprise-provided wearables can solve particular problems for specific roles, Forrester analyst JP Gownder notes in the report The Enterprise Wearables Journey. While there is a lot going on in the consumer space with wearable technology, he noted that enterprise products would have better security and stronger integration with other company infrastructure. Company-issued wearables enjoy a more seamless integration into company assets than catch-as-catch-can BYODs. Intel, software, and interfaces for wearables offers enterprise-grade application programming interfaces (APIs) to link wearable devices to standard IT systems. Samsung’s Solution Exchange provides APIs for independent software vendors (ISVs) to integrate Gear into software systems. problems for specific roles, he wrote in the report. Speaking from the Consumer Electronics Show, Gartner research director, Angela McIntyre, said the biggest buzz at the show was around smart, wearable devices. "Everyone was talking about wearables. But for a smartwatch to gain momentum in the consumer market people will have to buy into it as a fashion accessory. However, a smartwatch or smart pendant used at work, such as in a retail store, could provide shop floor staff with a screen to check stock availability." Adrian David Cheok, professor of pervasive computing at City University, London, is heading a team of researchers, which has developed a ring that can receive a message over the internet. This ring can be connected to an application that monitors big data. In the context of financial services, if there are changes in things such as stock prices, a message could be sent to the ring through the sense of touch. I could see wearables being huge in the medical space (above and beyond the FitBit approach in vogue now). Wearables could be great for tracking mileage in a convenient way. It could be useful for scanning areas for determining stock availability (as mentioned in the story). Much depends on the enterprise and what they hope to accomplish.